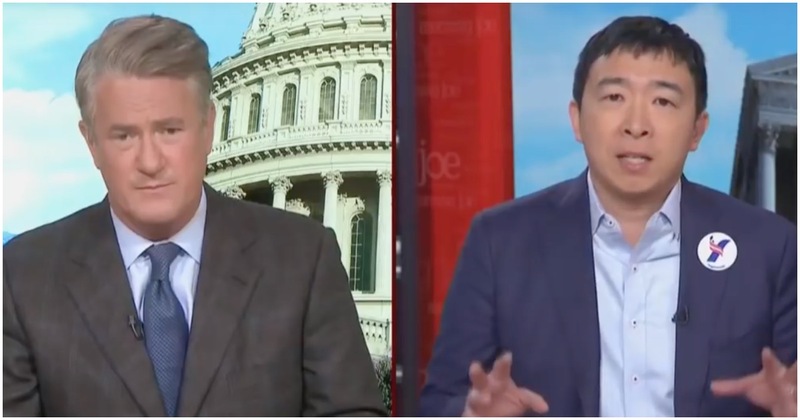 “Morning Joe” host Joe Scarborough had 2020 Democrat presidential candidate Andrew Yang on his show. Yang wants to provide every American with $1,000 a month. Of the many 2020 Democrat presidential candidates, Yang may very well be the least known – by a long shot. If you have ever heard of the founder of Venture for America, a non-profit organization that seeks “to revitalize American cities and communities through entrepreneurship,” you’re ahead of the curve. According to Yang, the next generation of white Americans will soon begin shooting up Asian churches. No, that is not a joke. At the same time, Yang may have as good a chance to secure the Democrat nomination for president as The View‘s Joy Behar. Democratic presidential hopeful Andrew Yang is finding a growing surge of online grassroots support for his longshot campaign in the form of memes. The 44-year-old serial entrepreneur’s online supporters, known as the Yang Gang, have started meme pages on Reddit, Twitter, and 4chan, placing Yang’s image on popular meme templates. The profile of Yang memes exploded last month after his appearance on the “Joe Rogan Experience” podcast, which is a favorite show within the meme community. Yang’s popularity is attributable in part to his universal basic income proposal, the centerpiece of his campaign, which entails giving every adult in the country $1,000 a month. The policy proposal is popular among a mostly white and male meme and gamer culture which shares Yang’s concern for jobs being lost to automation. LOOK: James Woods Drops Socialism Truth Bomb, Warns It May Soon Be Coming to U.S.